Ms Campbell is not new to the continent of Africa, but when she visited Ghana this year tongues were wagging as to what she would be doing there. It turned out one of the reasons was for a shoot for W Magazine. The brief for the shoot was the first Lady on a diplomatic mission to Ghana, the model was none other than Supermodel Naomi Campbell, or as W magazine referred to her as “The First Lady of Fashion” with the shoot depicting Naomi in her FLOTUS (First Lady of the United States) wardrobe, consisting of designers such as Prada, Dior, Nina Ricci, Hermes, Giorgio Armani, Marc Jacobs, Michael Kors, and was styled by top stylist and Editor, British-Ghanaian Edward Enninful, current Fashion and Style Director for W Magazine, previous fashion Editor of i-D Magazines, and stylist of the icon Italian vogues “All Black edition”. 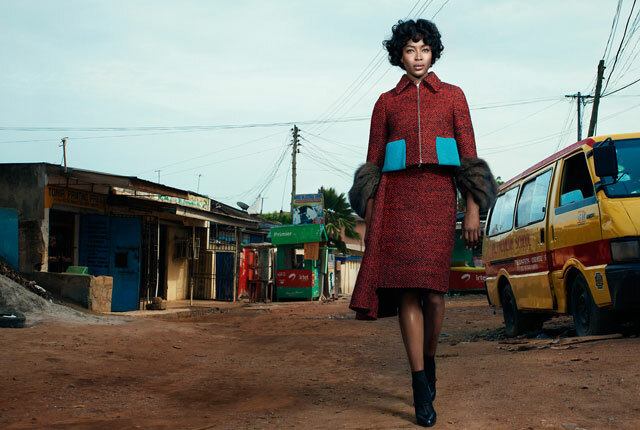 The shoot captures Naomi Campbell looking extremely sophisticated in various locations within Ghana’s capital Accra, such as Accra’s National Theatre, the Lobby of the Movenpick Ambassador, University of Ghana’s Legon campus, as well as some of Accra’s poorer suburbs. The images produced are classic, however they have raised question as to whether fashions first lady was really pictured in the streets of Accra, or whether the pictures were photoshopped into the desired locations, and whether the attire selected was suitable for Ghana’s sub-Saharan climate. Nonetheless we have to say regardless that Naomi looks amazing, and with a face and body that could give women half her age a run for their money, she definitely deserves the title of first lady of fashion.